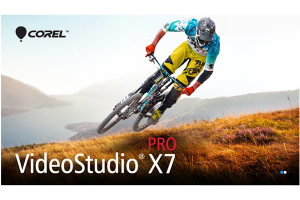 "Corel high speed HD video editing, producing and burning suite"
VideoStudio Pro is the ultimate suite for high speed HD (High Definition) video production. It provides a full-featured HD workflow to import, comfortably edit, burn and easily share HD or standard videos, featuring Blu-ray and DVD authoring. Thanks to this Corel software´s GPU acceleration, you will be capable of editing and rendering as fast as your creative mind moves, especially when working on HD videos. There is high quality content just like from RevoStock, you can begin with this new range of professionally designed templates. Not only that, but you can make use of a large palette of easy-to-use and efficient tools for video editing. With this software, you can produce movies in just a few minutes and then fine tune them with cutting edge tools as well. You will find live previews for special real time effects such as RotoSketch. Once your works are done, you can author using Hollywood-style menus for DVDs. VideoStudio Pro lets you share your story sending it directly to Facebook, YouTube, mobile device and more. It is even possible to burn HD videos to DVDs for later playback on a Blu-ray or DVD player.